The daughter of one of my oldest friends (I’ve known Ann since we were like 11 – 12 years old) graduated from BYU’s College of Nursing yesterday (way to go Alyse!). Her mom and dad threw her a party to celebrate so I made these cupcakes for the party. They came out pretty cute and everyone seemed to like them. 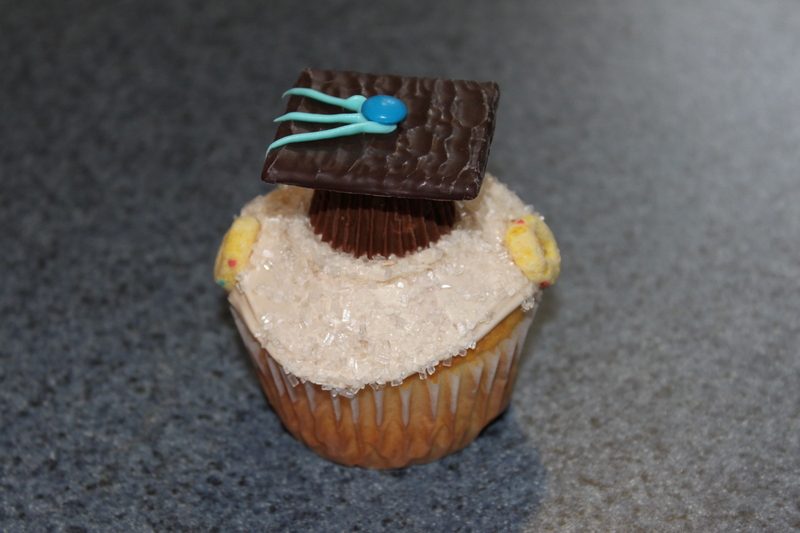 The recipe is from the book “What’s New, Cupcake?” by Karen Tack and Alan Richardson. 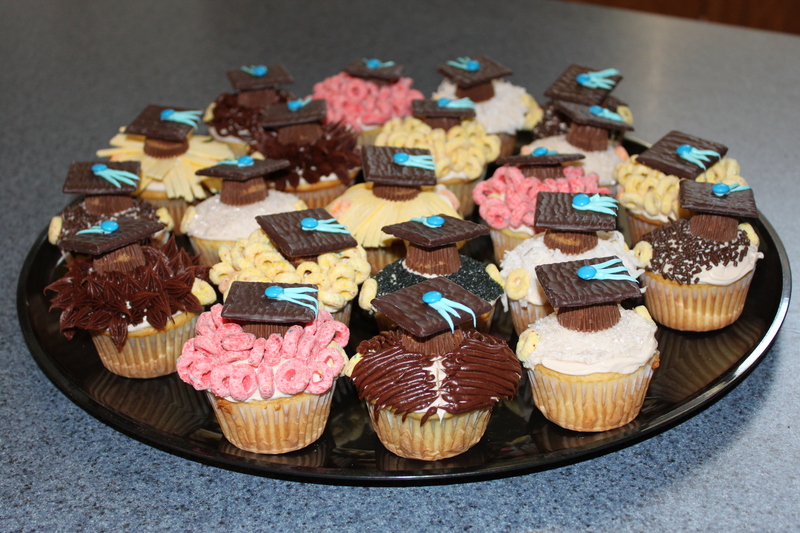 The cupcakes are the “Perfect Cake Mix Cupcakes” which are already on the blog so I’ll just tell you here how to make the “graduates”! 1 Tint 1/4 cup of the vanilla frosting with the yellow and red food coloring. Tint 3 tablespoons of the vanilla frosting blue. Spoon each color frosting into a separate Ziploc bag. Spoon the chocolate frosting into a Ziploc bag, press out excess air and seal the bags. Tint the remaining vanilla frosting light tan with red food coloring and the cocoa powder. (I just used the cocoa powder here.) Cover with plastic wrap and set aside. 2 Frost the cupcakes with a mound of light tan frosting and smooth. 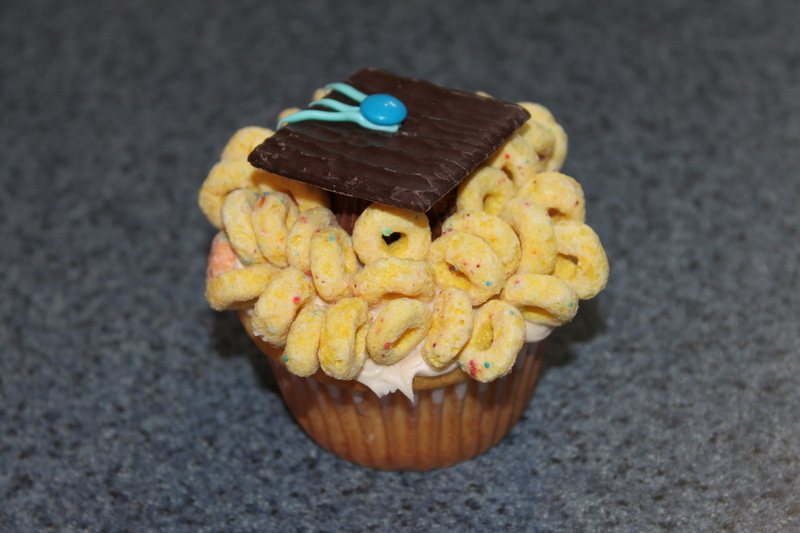 For the ears, press 2 orange cereal O’s on opposite sides of each frosted cupcake, just above the paper liner. (My box of Froot Loops hardly had any orange loops so I used yellow for the ears except on the cupcakes with yellow hair and then I used the few orange ones that I had.) Add hair as directed below. For a crew cut: Place the sprinkles in a small shallow bowl. Roll the frosted cupcake in the sprinkles to cover. 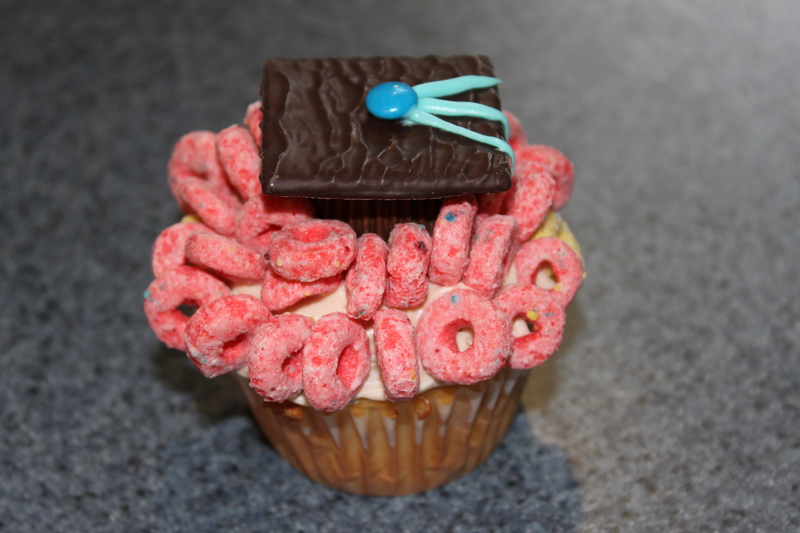 For curly hair: Starting at the bottom edge of a frosted cupcake, press the red cereal O’s into the frosting in overlapping circles, leaving the top empty for the graduation cap. Repeat with the yellow cereal O’s on another cupcake. For long blond hair: (Just FYI – the gum was really hard to work with, maybe mine wasn’t fresh or something, so I only did 2 gum heads!) Using scissors and 4 sticks of the yellow gum, cut lengthwise strips 1/8″ wide from 1 short end of each gum stick, leaving 1/2″ at the other short end uncut. Cut the remaining 2 sticks in half crosswise and cut more thin strips, leaving 1/2″ at the other short end uncut. Press the long pieces into the frosting at the sides and back of the cupcake and add the short pieces to the front to make bangs. For short blond hair: (I forgot to take a picture of my short blond hair cupcake.) Cut 6 gum sticks in half crosswise. Using pinking shears, cut 1 short end to create a zigzag end. Using straight scissors, cut long strips, leaving a 1/2″ section uncut at the straight end. Press the gum pieces into the frosting to create 2 layers of hair. For frosting hair: Snip a small (1/8″) corner from the bags with each of the tinted frostings. To make curls, (forgot to photo the frosting curl ones) pipe the orange frosting all over 1 cupcake. Repeat with the chocolate frosting and another cupcake. 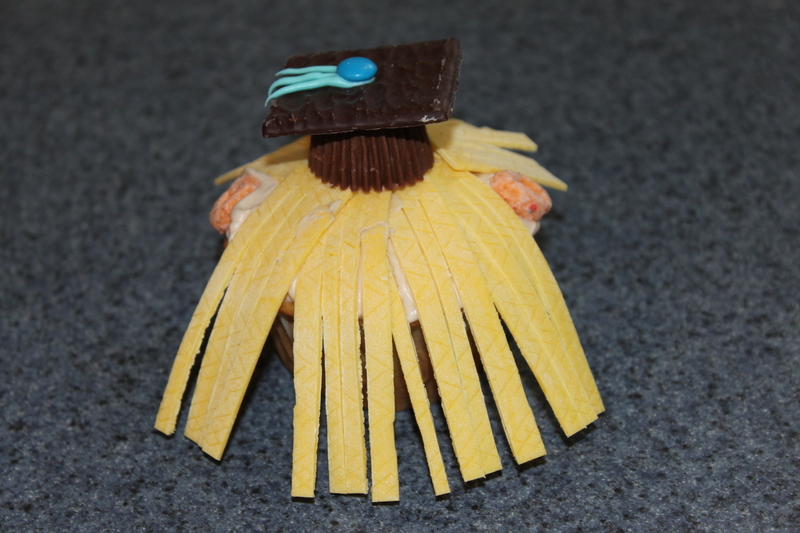 To make shaggy hair, start at the edge of the cupcake and, using the squeeze – release – pull technique, pipe rows of hair with the chocolate frosting. 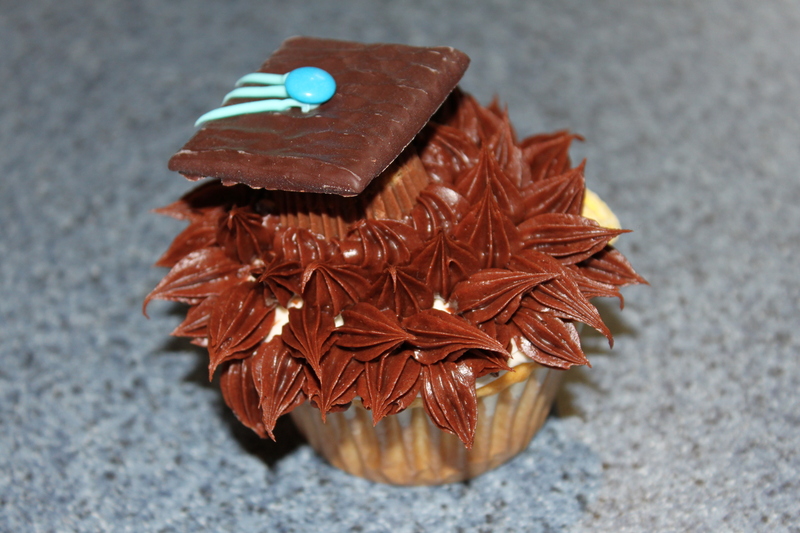 To make parted hair, mark a line down the center of the cupcake with a toothpick and pipe rows of chocolate frosting from the center line on either side, leaving a small gap to show the tan frosting. To make white shaggy hair: (This was my contribution to the hair styles!) 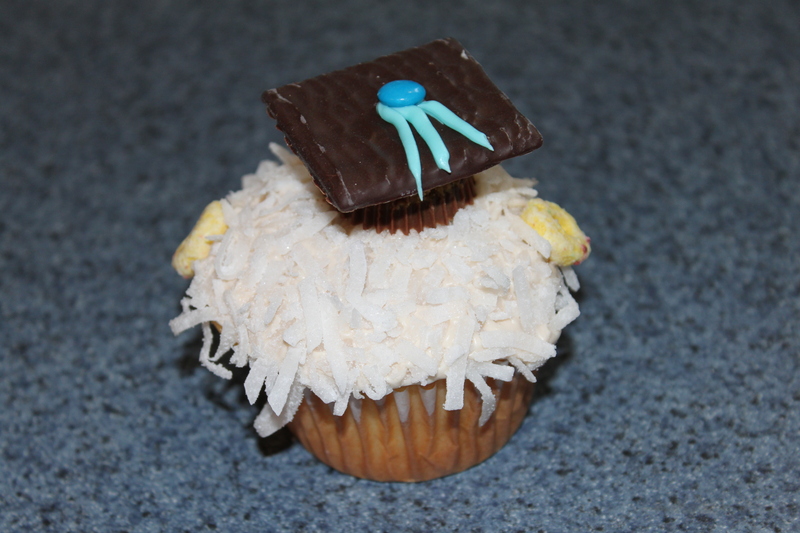 Pour shredded coconut on a plate and gently roll frosted cupcake in coconut to coat. 3 Press a chocolate peanut butter cup, large end down, on top of each cupcake, adding a dot of frosting to secure if necessary. 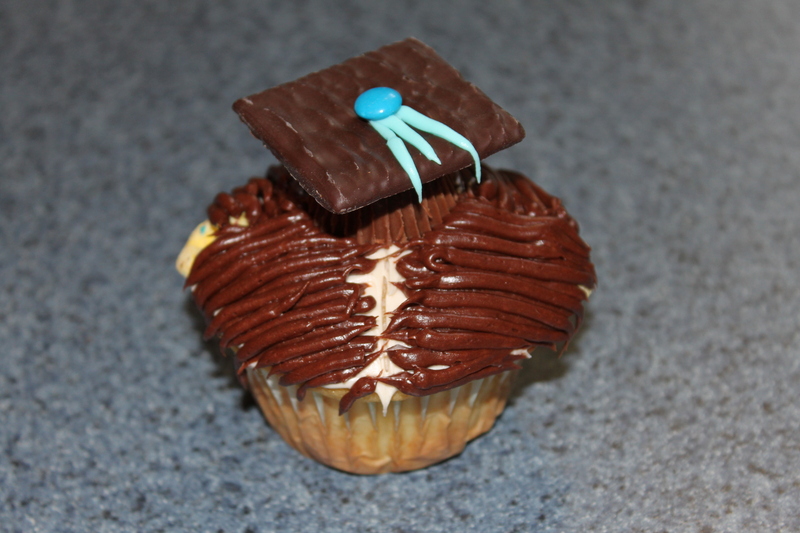 Pipe a dot of chocolate frosting on top of each peanut butter cup and add the chocolate covered mint or cookie as the mortarboard. 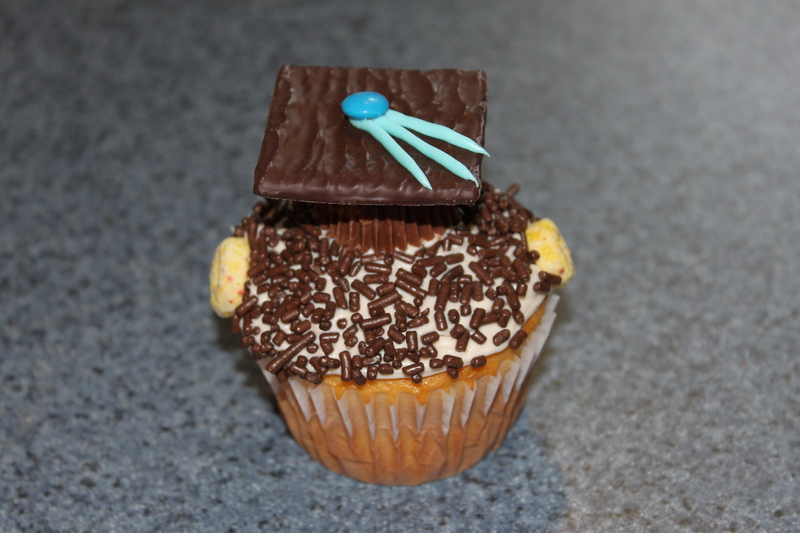 For the tassel, starting from the center of the mortarboard, pipe several lines of blue frosting, allowing the frosting to overhang the edge of the chocolate. Press a blue candy on top.